This new random map script features a huge continent covered mostly in forests. Each player starts in a small clearing with food, gold and stone, and with access to the sea. Usually it is not too difficult to cut your way through to neighboring clearings to expand into the forest, and you will need to, because the starting space if very limited! There are six different themes, each with different forest types and terrains - Standard, Alpine, Frozen, Asian, Jungle and Desert. They all have the same amount of forest, it just looks different. You starting space will quickly fill up with buildings so start cutting your way through to neighboring clearings (which should often be quite close). Just make sure you do not establish a land connection to your enemies before you are ready! It would be foolish to ignore the sea. There are fish to be caught, and you have lots of wood, so make sure you build a fleet - you don't want your enemies landing troops right in the middle of your town, just because you forgot to protect your seaport. If you're short on gold, consider sending trade cogs to your allies or perhaps try to cut through the forest to establish a land connection. The AI plays this map with some difficulty. Due to the space constraints in the starting clearing it will have trouble completing its build plan and will not do as well as well as usual, so consider using a harder difficulty level than you normally do. Also, it can occur that players are connected by a canal instead of by the sea. If this happens, try using a larger map to reduce the likelihood of player to player waterways. -clean version has no outlaws or rescueable gaia units. I hope you enjoy the map, and thanks for all the support! 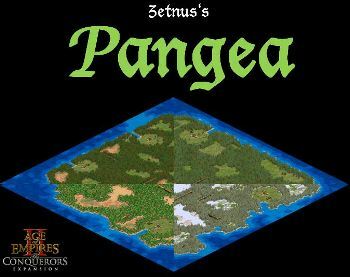 Pangea is a random map generator designed by Zetnus. The player is given a small clearing and a little bay in a huge forest to build their empire. The player will have to chop away a lot of wood (or research siege onager and target the trees with it) in order to acquire more space to build on. It is a race to gain more space than your enemies so you can raise an army before they do so and find a path to you. The theme of this random map fits the name and description really well. As described above, players are given a small clearing and a little bay in which they must expand to be able to build up. The map is very appealing but still has the general feel of an ordinary ES-generated map. Maybe if the creator could include some Gaia decoration objects or "lost" units that you can capture, it may be a bit more interesting. The maps are playable if you are patient. You need to do a lot of economical micromanaging to make sure your villagers cut the trees where you want to expand your clearing. It is a slow game due to the lack of building space at the start, but once paths begin connecting the battles can begin. Sometimes I have noticed that your ally will not build a dock for you to trade with nor a navy unless you use the chat commands to order it to build a navy. Sometimes the AI players will fail miserably expanding space properly or will place buildings in spots so that units created from the building become trapped between the forest and the building itself. They tend to use farmers more than lumberjacks, the resulting over-farming restricting their building space even more. This can be fixed with a pro-lumberjack custom AI. I agree with basically everything you've said. Usually I stick with ES-style maps without too much extra deco or recoverable units. But for this one I can imagine that a couple of of bandits and recoverable units (maybe even a siege onager) in the clearings might add to the excitement and encourage more tree chopping. I'll include a couple of things like that when I update the map!